LNGC Velikiy Novgorod under construction. When it comes to Arctic operations, the Russians arguably have more hands-on experience and investment than any other nation. 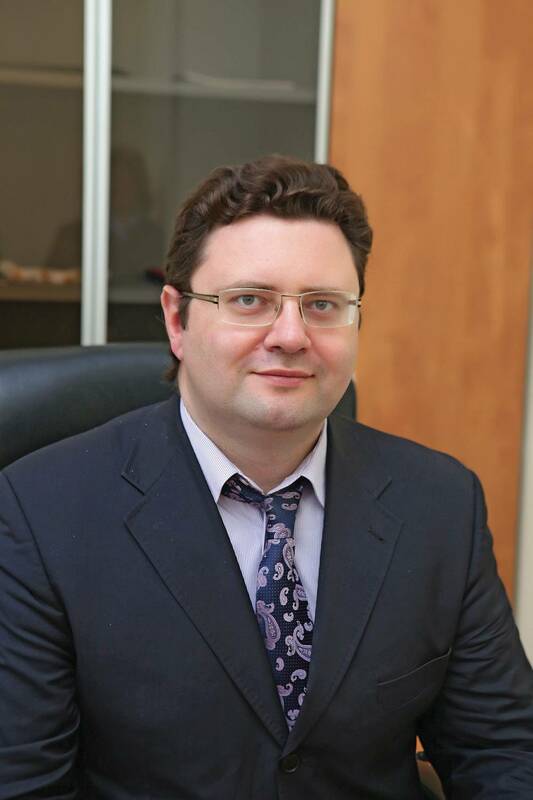 With that in mind, Maritime Reporter spoke recently with Georgiy Bedrik, Head of the RS Business Development Division, for his input on RS and matters of the Arctic, maritime and offshore. Please give a brief description of the market you serve. In maritime, RS renders a full scope of classification services for ships including plan approval, survey under construction and in operation, as well as statutory surveys in compliance with international codes and conventions. RS is well represented with the local offices in major shipbuilding regions and survey stations at big ports worldwide. 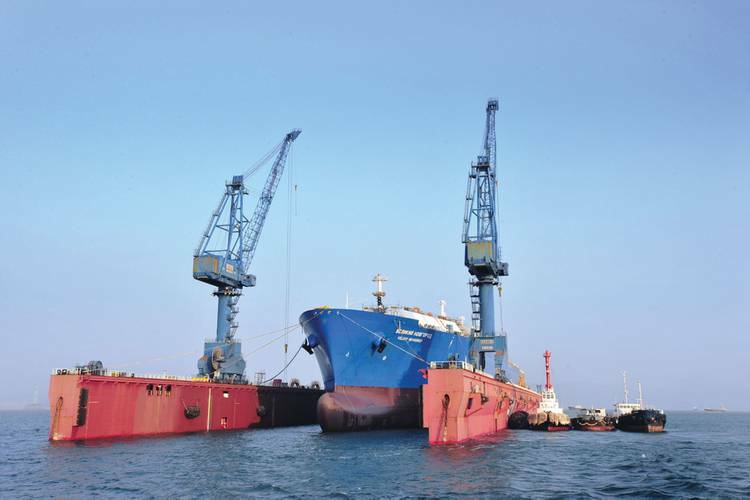 With a variety of ship types in class, RS nowadays is primarily focused on special purpose fleet to support offshore developments, along with ships intended to be operated in harsh environment. With its ice class expertise, RS holds the leading position in classification of icebreakers and ice class ships. Today, there are over 3500 ice strengthened ships in class, including 30 designated icebreakers. The experience gained through decades serves as a firm basis for further research and developments towards fit for purpose improvements of ice class specific requirements, with particular respect to environmental safety provisions. In the offshore realm, RS has accumulated significant experience in plan approval, classification and survey during construction and operation of offshore oil and gas facilities intended for operation in harsh climate. RS is involved in all current Russian offshore projects, including the Arctic sea shelf development. The offshore structures under RS survey vary from fixed ice-resistant offloading terminal in the Arctic to 6th generation mobile offshore drilling units and subsea pipelines. And last but certainly not least, in the area of certification RS carries out survey during manufacture of materials and products in accordance with the requirements of international conventions and agreements, the RS Rules, IMO and maritime administrations’ recommendations. What has been the defining trend or market condition that has most affected your business in the past year, and why? One of the defining trends of the industry in the past years is a great focus on the gas transportation technologies. The leading yards develop new state-of-the-art gas carrier designs while shipowners place their orders for new LNGCs and LPGCs. This trend affects RS, expanding its involvement in gas carriers newbuilding projects. Currently, RS is in progress of survey of large capacity LNG carriers under construction for Sakhalin area, thus introducing this state-of-the-art technology into class experience. The prototype ship Velikiy Novgorod has already been commissioned. It is an Atlanticmax gas carrier with membrane cargo tanks of 170 000 cu. m. total capacity. The machinery and equipment are certified to operate at temperatures as low as – 30 °С. The specific feature of the newbuilding is a three-fuel diesel-electric propulsion plant allowing to use the LNG carried as fuel. The use of gas as fuel will enable reduction of nitrogen and sulfur emissions to the atmosphere, which is an important step towards reduction of the maritime transport share in the environment pollution. What do you consider to be the biggest challenge to your business in the coming few years (either from legislative, financial or other market conditions). Today, the technological development enables large ships to pass along the Northern Sea Route, while the Arctic oil and gas development projects are under way. That is why the LNG transportation in the freezing seas is a very promising segment of shipping development. Yamal LNG project on LNG transportation from South Tambey gas condensate field on Yamal Peninsula via Sabetta sea port to Western Europe, the Americas and Asia Pacific region is already launched. The project foresees the construction of up to 16 innovative Arc7 gas carriers. Therefore, the steady demand for ice strengthened vessels for operation in freezing waters is increasing. The RS potential as the leading classification society regarding the ice class is to be requested for the construction of icebreakers and OSV, Arctic class tankers and gas carriers in the coming years. This will require from RS to maintain or even increase the number of experts with relevant qualification in ice class. The development of new ice class ship designs will require an elaborate ice classification system and relative flexibility of the normative base. The rules of Russian Maritime Register of Shipping currently make it possible to design and construct the most innovative vessels. A good example of an innovative vessel construction to RS class is an oblique icebreaking salvage ship Baltika. The ship’s asymmetrical hull shape and three azimuth propulsors enable the Baltika to make by a single pass when moving sideways a navigable canal up to 50 m wide. By way of comparison, the overall beam of a ’normal’ icebreaker is under 30 meters. How has your organization invested recently to enhance your product/services? The use of so-called ‘double-acting ship’ concept leads to the fact that the ice strengthening of the aft of such vessels shall comply with the requirements applicable to the bow of the ship with corresponding ice class. The need to comply with the hull shape requirements complicates the design in case of the adoption of innovative design solutions (e.g. placement of three azimuth thrusters). RS has gained significant experience in the rationale for the estimated ice load in aft part. The application of bulbous bow on Arctic ships is another challenge. Thus, further improvement of RS Rules’ requirements to design ice load value for non-traditional shape of hull is considered as the one of the most promising developments. During the past five years RS has substantially expanded the competence on Arctic LNG carriers: RS carried out the Approval in Principle for GTT methodology to calculate global iceberg loads and for membrane cargo carriage systems for Arc7 ship operation in the Russian Arctic and along the Northern Sea Route. The new ice class gas carriers are mainly constructed at South Korean yards, therefore, in this country we opened Design and Newbuilding Support Center to render the full range of RS services for Korean shipbuilding market, including design review, surveys of ships during construction, certification of marine equipment. We also carried out theoretical and practical training of our surveyors with due regards to the modern international experience. In 2012 to 2013, due to predicted activity growth in design and construction of LNG carriers for procurement of large Russian projects on LNG production (Vladivostok LNG, Yamal LNG, etc. ), another two training seminars on LNG transportation by sea were held for surveyors at the RS Training Center. Further on, during 2013 to 2014 the trained engineers proceeded to a yard in South Korea for on-site training on LNG tankers under construction. Currently, their training is successfully completed. RS has by now trained about 70 experts as part of the program for instructing personnel to be engaged in state-of-the-art gas carrier survey and nowadays possesses sufficient number of highly-skilled experts in classification services during construction or operation of state of the art LNG carriers all over the world.